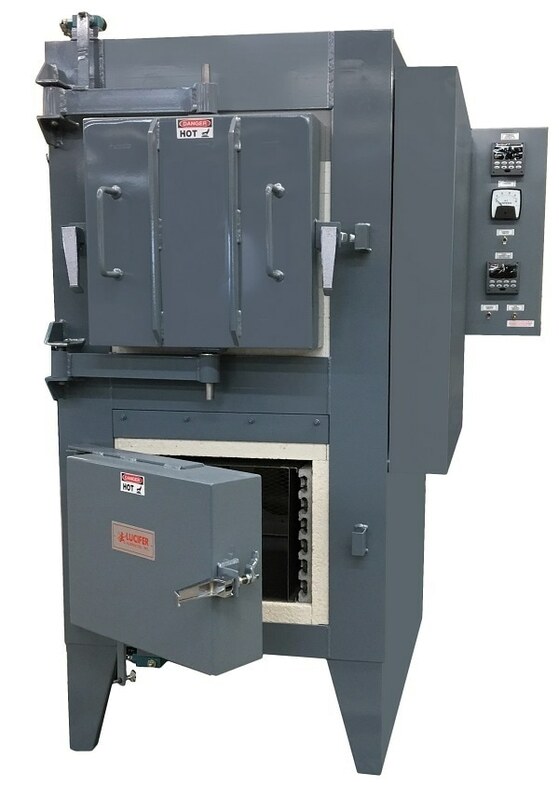 Lucifer Furnaces, Inc. has designed a delivered a dual chamber furnace ideal for heat treating high speed steels. The HS8 Series, built with rugged 12-gauge sheet steel and reinforced throughout, heats to 2450°F in the upper chamber with silicon carbide heating elements mounted across the roof and below the hearth. Elements are a solid bar type with termination connections for easy service via removable covers on both sides of the furnace. The upper chambers of these high temp furnaces are insulated with 6.5” of combined ceramic fiber hot face and mineral wool cold face insulation for lower power demand, with staggered seams to block direct heat flow to minimize outer shell temperature. The lower chamber of the HS8 series is a recirculating oven reaching up to 1600°F with a high volume rear mounted fan directing air flow horizontally through the chamber for temperature uniformity. A stainless-steel liner isolates the coiled heating elements from the workload. Heating elements are mounted in removable holders for easy replacement. Lower chamber insulation consists of multilayered lightweight insulating firebrick hotface and mineral wool backup, dry fit to allow for thermal expansion. The double pivot horizontal swing door on the upper chamber and lower chamber horizontal swing door are both insulated and secured with cam locks for a tight seal. Safety switches shut off power when doors open. Temperature sensing in the upper chamber is achieved with a type R platinum thermocouple for fast accurate response and extended life at elevated temperatures; the lower chamber is standard with a type K thermocouple. Standard controls, mounted in a side mounted NEMA 1 panel, include a Honeywell DC2500 time proportioning controller for each chamber as well as an SCR power supply for the upper chamber to regulate power demand for steady state control, an alternative to tap switches. This furnace, model HS82-M24 with inside chamber dimensions of 12”H x 12” W x 24” L, will be used at a large corporation in a newly built tool room. The HS8 Series can be customized by chamber size and with controls, recording features and door arrangements to meet a customer’s need.